After Easter I made a patch of pesto with our leftover basil that I’ve been trying to find a way to use. Laying in bed last night I had a “EUREKA” moment on how to use it. Well, I decided that I was just going to use it. I have to give credit to B for coming up with the idea to marinate the shrimp in a lemon garlic sauce to add a little bit of a citrus flavor to the dish. B called this one of our “restaurant quality” dishes. I can’t disagree. This is nice especially for summer because of the pesto. Also, it wasn’t overly pesto-y, which is something that B and I both look for in our pesto dishes. Enjoy! (1) For pesto: Combine the basil, garlic, and pine nuts in a food processor and pulse until coarsely chopped. Add 3 tbsp of the oil and process until fully incorporated and smooth. Season with salt and pepper. (2) For shrimp marinade: Take remaining 3 cloves of garlic and mince. Add 1/4 tsp olive oil, garlic, lemon juice, and lemon zest with shrimp. Mix and cover. Let sit in fridge. (3) To roast tomatoes: Preheat oven to 300 F. Cut tomatoes into approx. 1/2″ slices. On a foil lined baking sheet, spray cooking spray and lay out tomatoes. Spray again and season with salt and pepper. Allow to roast in the oven for 1-2 hours or until tomatoes look shriveled and are no longer juicy. (4) We grilled the shrimp on skewers for about 2-3 minutes on each side. The shrimp could also be sautéed on a stove top. 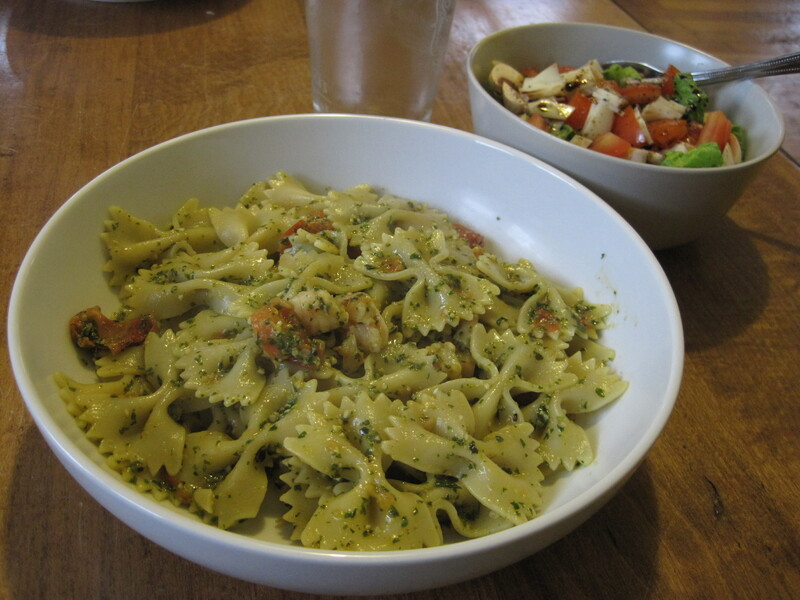 Add pesto, shrimp, and roasted tomatoes to the cooked pasta. Mix well. Serve warm.